Burgers are so delicious, don't you think? But what about preparing some cute little ones filled with your favorite ingredients? 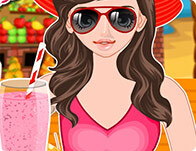 In this cool food decorating game you will find many delicious stuff to make your little burgers. Choose from each category the ingredients you prefer to decorate this tasty fast food sandwiches! Enjoy!